Ten people travelled by bus or car to Holmewood for a four mile circular walk covering part of the Five Pits Trail. All those who joined me were regular walkers from our Ramblers’ Groups, although one lady had come with her husband who wasn’t a regular walker. After all the glorious weather we have recently enjoyed the weather was overcast – and after about 30 minutes walking it rained steadily for the best part of an hour. The route took us alongside Williamthorpe Pond, stopping to read the information boards we passed – and we paused briefly for a drinks stop by the Wolfie Pond. Someone asked how this pond got its name, but no one could give a satisfactory answer. A German fisherman named Wolfgang ? Because of the rain we probably walked a little faster than we might have done if it had been fine, but it meant that we arrived at the bus stop with less than ten minutes to wait for the journey home. After the harsh weather of twelve months ago, what a change. Probably the warmest February day we’ve known. A seven mile local circular from Somersall Park to Stubbing Pond and back for a group of 35, with sunstroke a greater danger than frostbite this year. 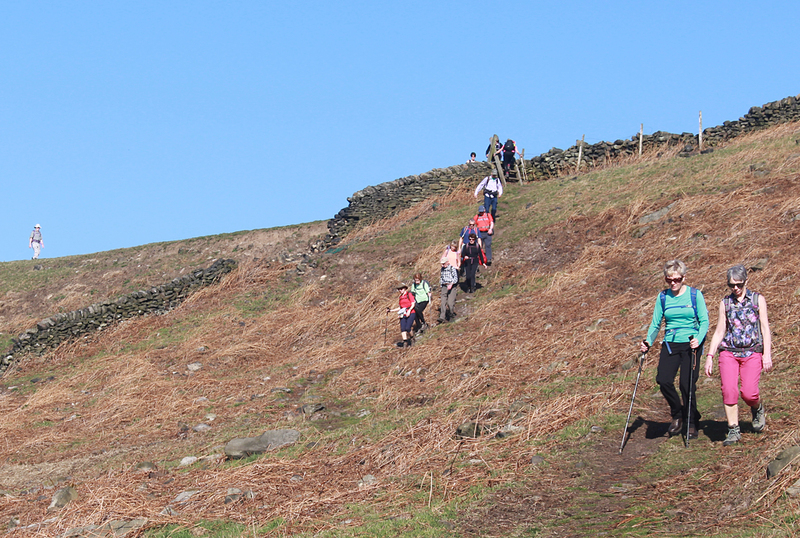 A group of 19 enjoyed the glorious sunshine as they set off from the wall of Damflask Reservoir. Remarkably the sunshine continued for the whole day as they walked along the south side of Damflask and then headed uphill to High Bradfield Church, where they had coffee. The route followed the Sheffield Country Walk to Low Ash Farm, then descended through Loxley Common, before crossing the river Loxley twice. At Rowett Bridge the route climbed again through Storrs and Hill Top. A rare treat, especially for Mel, was an ice cream break, in February, at Our Cow Molly’s Farm after which it was downhill and back to the cars. The distance was about 11 miles. The hint of an early spring continued for 18, who followed a 10 mile route from Curbar crossroads over Ramsley Moor, Big Moor, White Edge, and Froggatt Edge. Cold and foggy for the start, but warm spring weather soon materialised. The next Saturday walk is on 9 March from Langwith Whaley Thorns Heritage Centre, via Holbeck and Creswell Crags. Our group is leading nine walks in the Festival, including the Chesterfield Round Walk from Calow, the GHB Ward walk from Holmesfield, and an evening stroll from Killamarsh. Donations will be gratefully accepted as usual on behalf of the Air Ambulance and Mountain Rescue Services. Armed with the Derbyshire Wayfarer, a dozen walkers took the train to Ilkeston, a station less than two years old, built to cater for a town which reportedly was the largest in England to have a passenger line passing through it without any station at which trains could stop. A circular route took the group up the Erewash Canal, before cutting across into Shipley Country Park. At lunchtime, a brief spell of sunshine at the site of Shipley Hall, sadly a victim of coal mining subsidence. 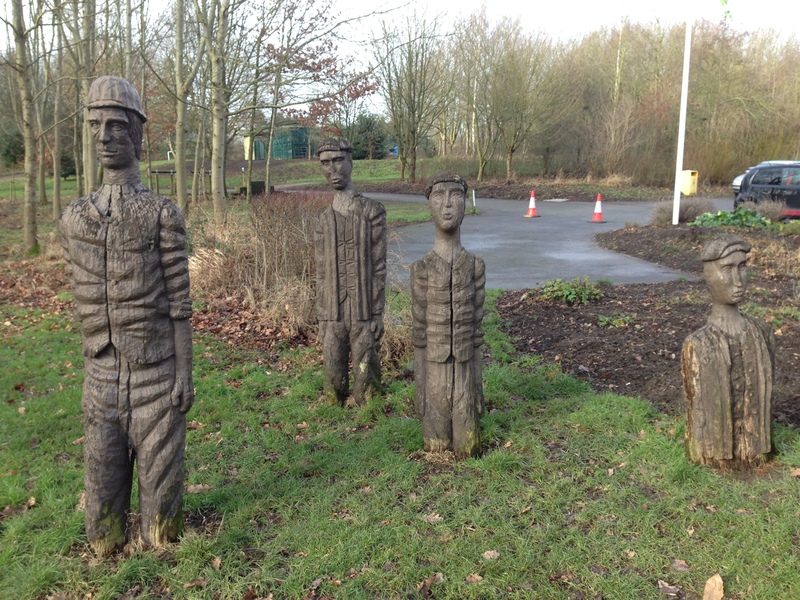 A return to Ilkeston via the Nutbrook Trail. We took advantage of it while it lasts and 14 of the group filled the 10:00 bus to Stanton Hill in Nottinghamshire. Brierley Forest, Tibshelf and Pilsley to catch a return bus to Chesterfield at North Wingfield. Starting from Monsal Head, 24 members descended into Monsal Dale to be treated to sightings of dippers accompanied by bright sunshine, the sound of fast flowing water passing over stones, and the gentle lapping of waves along the banks of the River Wye. Following a short climb to Brushfield, coffee was taken before traversing High Dale to reach the lead rakes above Litton Mill. Lunch was taken in Tideswell Dale before moving on to Tideswell and Litton village. After skirting Litton a stretch of field walking, with excellent views created by the superb limestone walls, leading to the woods above Cressbrook Dale. Descending into the Dale the group crossed the Wye again at Cressbrook before climbing up to the trail for the return to Monsal Head.